This 2-Day Masterclass will comprise of a series of lectures, case studies and discussions conducted and facilitated by Professor Chakraborty from the Technical University of Munich (TUM), as well as trainers from the RACE Academy team. The Masterclass is held in support by e2i, allowing subsidies for Singaporeans and Singaporean Permanent Residents (PRs). We are currently in Industrie 3.0, where robotics and motion control are employed in automating tasks in manufacturing. As we move towards the fourth industrial revolution; Industrie 4.0, it takes a step further by introducing technologies such as cyber-physical systems, the internet of things, cloud computing, data analutics and big data to create a revolutionary approach to manufacturing. The cornerstone of modern industrial automation and manufacturing systems are intelligent control algorithms. While techniques from control theory for developing control algorithms are well established, as the implementation platforms for these algorithms are becoming more complex, heterogeneous and distributed, traditional implementation techniques are no longer sufficient. In particular, there is a “gap” between controller models and their implementations resulting in unpredictable and incorrect behaviour of the systems being controlled. In order to address this problem, a “Cyber-Physical Systems” (CPS) approach is now being developed that relies on a tighter integration between the models of physical systems being controlled and the computational platforms running the control algorithms. In this module, we will discuss the need for such a CPS approach and trends in this area. Day 1 is delivered by Prof. Chakraborty. Here, we will start with the recapitulating basic principles of control systems design. We will then look at emerging trends in distributed computation and communication platforms that are used for implementing control algorithms. This will be followed by concrete examples of why traditional implementation techniques for control algorithms no longer work. Finally, we will present some basic principles of cyber-physical systems design. The module will not assume any previous background in control theory or computer systems design. All the examples and techniques will be developed from first principles. Day 2 will be delivered by the RACE team. Participants will implement a basic cyber-physical system using industrial collaborative robots. 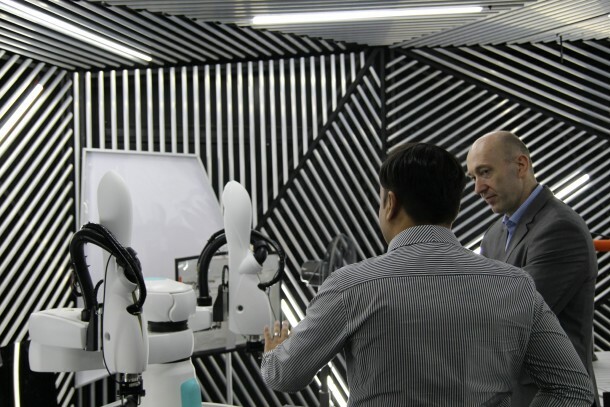 Here, hands-on exercises are emphasised in order to enable participants to appreciate the concepts of interoperability by designing and creating a RESTful API to interface with the collaborative robots. Samarjit Chakraborty is a professor of Electrical Engineering at TU Munich in Germany, where he heads the Institute for Real-Time Computer Systems (RCS). Prior to joining TU Munich, from 2003 – 2008, he was an Assistant Professor of Computer Science at the National University of Singapore. He obtained his Ph.D. in Electrical and Computer Engineering from ETH Zurich in 2003. His research interests cover all aspects of system-level design of real-time embedded systems and software, including automotive electronics and software, advanced automotive driver assistance systems, e-mobility, electric vehicles, real-time multimedia processing, and body-area sensor networks for health monitoring. In addition to his Chair at TU Munich, Prof. Chakraborty leads a research program on embedded systems design for electric vehicles, at the TUM CREATE Centre for Electromobility in Singapore, where he also serves as a Scientific Advisor. Prof. Chakraborty has published over 100 articles on various aspects of real-time, embedded and cyber-physical systems, and regularly serves on the technical program committees of DAC, DATE, CODES+ISSS, EMSOFT, ASP-DAC, RTSS and RTAS. He has served as the general chair of the Embedded Systems Week (ESWeek) 2011, was one of the general chairs of the 9th International Conference on Embedded and Ubiquitous Computing (EUC) 2011 and is a general chair of the IEEE International Symposium on Industrial Embedded Systems (SIES) 2012. He has also served as the technical programme committee chair of the International Conference on Embedded Software (EMSOFT) 2009 , and has been a Track/Topic Chair in several editions of DATE, ASP-DAC and RTSS. For his Ph.D. thesis, he received the ETH Medal and the European Design and Automation Association’s Outstanding Doctoral Dissertation Award in 2004. His work has also received Best Paper Awards at ASP-DAC 2011, EUC 2010, a HiPEAC Paper Award in 2009 and Best Paper Award nominations at RTSS 2011, EMSOFT 2010, CODES+ISSS 2008, ECRTS 2007, CODES+ISSS 2006, and DAC 2005.